The cities and regions of the state present themselves at the annual Rheinland-Pfalz-Tag. In recent years, West Palatinate communities were hosts of the state festival twice: the city of Pirmasens in 2013 (21-23 June 2013) and the district administration of Ramstein-Miesenbach in 2015 (26-28 June 2015). 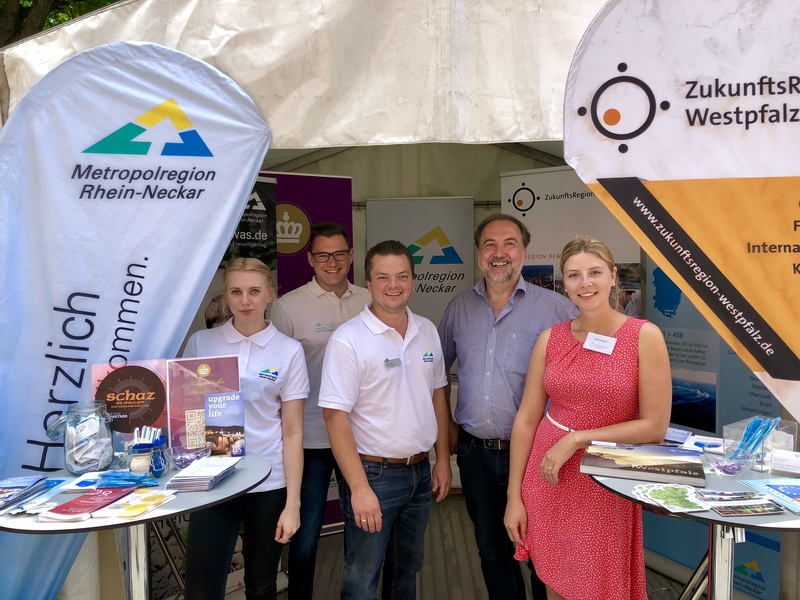 At both event weekends, ZRW was present with its own stand and informed interested visitors about its own initiatives and the West Palatinate region. In the year 2013, the Rhine-Neckar metropolis region could be involved in setting up a stage programme at the Rhineland-Palatinate Day in Ramstein. Together with ZRW member radio station RPR1., we made it possible for three young West Palatinate bands, No Time to Expect, The Beautiful Dead, and Straight Curve, to perform in front of a large audience. Short video clips can give you an impression of our information stand and the bands' performances. Project partners 2013: City of Pirmasens | Pirmasens Marketing e.V. | ZMRN e.V. Project partners 2015: VG Ramstein-Miesenbach | RPR1.